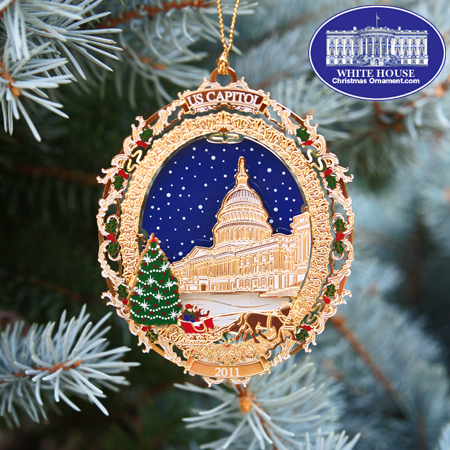 Christmas Ornaments Made in USA - 2011 Official U.S. Capitol Holiday Tree & Carriage Ornam - A Christmas Ornament Co. This official 2011 ornament from the United States Capitol Historical Society captures a beautiful holiday-night scene from nostalgic times past. Set in bold relief against a starry night, the U.S. Capitol building is the main focus of the ornament. In the foreground, in the midst of a fresh covering of virgin snow, a couple slides along romantically in an open sleigh drawn by two horses. Between the open sleigh and the Capitol Building is a Christmas tree decorated handsomely, its tinsel glimmering by the light of stars. Encircling this ornate piece of art is finely detailed gold gilding, intertwined with boughs of holly. The top of the ornament is engraved "US Capitol" and the bottom reads "2011." This is a beautiful heirloom-quality decoration that is sure to delight any recipient or simply as a gift to oneself.